A smart avatar named Tom Bukoswki gathered some (historical) data and case studies about our world in his clickers book "Coming of Age in Second Life". 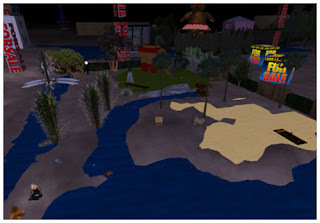 He describes the local conditions in Second Life around 2006: "By August 2006 over half of Second Life was islands, leading to concerns over the future of mainland.". Always most popular places have been the low lying beach fronts. Who does not want to live in a tropical beach paradise? Always nice weather, direct view onto the ocean. Even an avatar dreams about such scenarios - well given that we can. Guess where I bought my first land, when I came to Second Life in December 2007 (my clicker probably annoyed from the cold winter days in Real Life)....it was waterfront land. But it was not located on an island, it was mainland. Looking at the Second Life world map you can see how much space the islands nowadays take compared to the mainland continents. In 2010 private islands (often zoned by themes and following one single design style, makes them look less chaotic compared to the old mainland continents) got so popular as living ground, the Lindens had to think about a new strategy. Why become a VIP avatar (avatars whith clickers holding a premium account), when you can rent for similar prices on a private sim. You stay flexible, as you don't own the land and have to sell it when you wanna move and maybe loose money that way. I lost a lot of Lindens when I sold my mainland plot in 2008, which was grown to 9042 sq after a short while. Anyway the new strategy is to offer a house with atiny bit of land in a themed area. The only benefit I see is, that the prims of the house do not minimize the 117 per 512 sq you usually get. Besides those areas look like american suburbs if themed or not. They have an official meeting place integrated, thats a plus compared to the american suburbs from the Real Life world. But I don't know if people use those or prefer to teleport out to gather with other people or even start feeling lonely and isolated like humans living in american suburbs. The Lindens advertise those "new" homes as a social environment, a place to be creative - whose creativity will not be killed by suburbian cultures? - they point out that you get a permanent virtual adress that way and you can experience with your look in the privacy of your home. Well, and who did not try to zoom into other buildings...that prominent feature only we avatars have. So much for the privacy. And no security system keeps people from caming you. What':s most funny is the comic strip about those new Linden homes. Where to go, when you date your future dream partner? 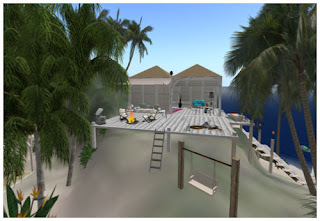 Didn't we all ride the emotional rollercoaster (more or less high), when we came to Second Life? But can this really be the reason, why we become residents of Second Life? When I was writing this second part about residential related issues in Second Life I got a message from my landlord telling me that he's restructuring his sims and stops renting out single houses. I hope it's no bad karma I provoced writing this blog entry. While moving once in a while can be refreshing and kinda renews your avatar life - loss of old neighbors, gain of new one, maybe making some new friends, new view in front of your windows - I start getting tired of finding new homes. To understand this I will tell you a bit about my residential history. Experimenting is an essential part of each avatar life. One way to experiment is learning by doing. I guess I tried most ways of residential living in Second Life to find out, what suits me best. At that time pretty for sale signs around. I started of with owning mainland and fast learned about prim restrictions and how those make you buy more land. In about two month my land holdings grew from 512 sq to 9024 sq as I needed prims for building urgently. My motivation to own land was learning how to build, to design a chill out area and to open an art gallery. My former neighbors at Druids Post, whose land I mostly bought as those moved to a private sim, tought me a lot about building. One even tought me about male chauvinism and how he transfers gorean life in Second Life partly to his clickers real life, but that's another sad chapter called how avatars not only annoy yourself but your clicker as well. Gallery building set up in the background. After doing a nice chilly area design for the land, setting up the gallery project and running the opening exhibition, I (or even my clicker) was at the usual point where "we" get bored. We never lack ideas, but we need new projects after old started of well. Besides I became concierege of an university sim meanwhile, so I had a pretty busy avatar life - too busy. Doing things half way does not work in SL. You need to stay popular by word of mouth to run a project constantly successful. And I simply ran out of time. Even avatars can get stressed. We need to get logged off once in a while to gain engergy. That's why I decided to move on. A coincidence brought me to the High Valley, which was owned by a friend of a friend. I reduced the plot size to half of the Druids one and was just keen on doing the area design, which for me is always the best part with new land. Besides I hoped to make it a third place, but I found out that private sims can be pretty lonely. There is nearly no traffic by accident on a residential private sims with no other attractions. I seldom was home and did not enjoy being there too much....so time to move on. That time I was more smart and chose a private sim with an attractive surf beach and therefore more traffic. Indeed I felt more home on Tuli Bahari as I ever felt in the High Valley. I knew the owner of that private sim before I decided to rent a plot with a house on it. I added a new quest to area design and another gallery - I built up a business. Sold mostly beach furniture with my business partner. Again an experimental project which was about marketing in Second Life. When the shop was set up, all learning was done and it was time to move on, because of other reasons as well, but this time I stayed on the same sim. My beloved and lost Tuli Home. The house was always too big, even used as a gallery and a small beach shack was just enough and exactly what I needed. A place for myself. To enjoy the view from a hilltop, facing the waves on the water. But then it started - the unwated relocations. 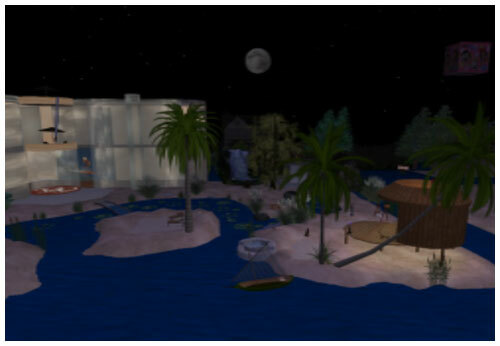 Tuli sank into the waters of infinite cyberspace on oct 5th 2010 and I found my new home at Aussie Cove in the Monkeys region - eight connected surf sims. I loved the view, but that place was always connected to other people and not really all mine. I felt lonely up there, even if it was beautiful. There was no connection to the few neighbors, which were seldom around when I was. Like when I rented the shack on Tuli, I wanted a home which felt mine, was just for me, but surrounded by nice people, a nice neighborly community and a place for my desk to write my blog at. Syx Monkeys - different sense of being. I found it two sims away at Syx Monkeys. I love to enjoy the view while writing, I have great neighbors and now again I need to move without having the drive to. Why do I start searching a new home before the old one is really lost? I could stuff all my furniture in my huge bagpack. can it be possible that I adopted my clickers fear of being without a proper home? Did you recognize the change in motivation for a place of residence? First it was mostly project orientated for sure always with the wish to be part of a neighborly community, then residing was the crucial factor. I was created for work, but now I live my avatar life. Can I?